The Add Class window allows you to enter the majority of the class information that is found on the Class record > Summary tab (excluding gender and age settings). You can choose to enter as much of this information initially as you wish but at a minimum you must enter the required fields (marked with '*'). Point to the Classes in the menu bar and click Add Class. In the Add Class box enter a Class Name. If you have more than one Location in your database, select the appropriate drop-down. 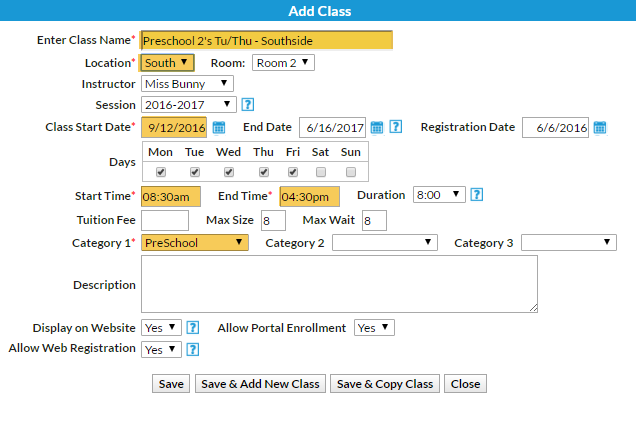 Optionally, select a Room and Instructor for the class. You may opt to assign a Session. If you designated a Start Date, End Date and Registration Date for the Session when you were customizing your drop-down lists (Tools > Edit Settings > Drop-down Lists) these fields will automatically populate. Edit as needed. Although not a required field, it is recommended to check the box for the day(s) the class meets. Enter the class Start Time and End Time. The Duration will automatically calculate based on those times but can be edited if needed. You can add the Max Size and Max Wait at this time or you can add them later. The Tuition Fee is only needed if your database is setup for Class Based Billing. Select the Category 1 and optionally choose a Category 2 or Category 3. To learn more about Category 1 check out our Customize Drop-down Lists section. Enter the class Description now or leave it for later. Set your preferences for Display on Website, Allow Web Registration, and Allow Portal Enrollment. See the Class Fields Explained section of this article for more information about these fields. Click Save or Save & Add Another. After the class is created, the Class record displays open to the Summary tab. Click the Copy Class button to copy a class with similar details. Change the name when prompted and make changes to details as needed. Another option to make changes to a group of classes at one time is to use Classes > Edit All Classes. The How To Guide has more on copying / editing classes in the Classes / Lessons section.